Buffalo Bills LB Reggie Ragland is expected to be ready for training camp. 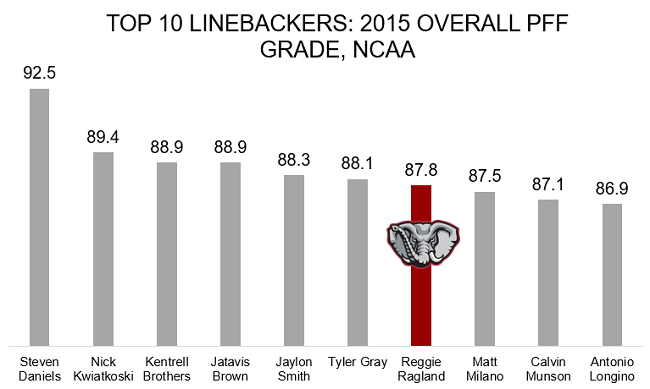 Ragland was hoped to be a starter for the Bills last year after being selected 41st in the 2016 draft, but tearing his left ACL on August 5 forced him to miss the entire season. He was ranked PFF’s seventh-rated linebacker in college in 2015, after playing 826 snaps, registering 52 defensive stops and 20 QB pressures that season. Despite being the second-most targeted ILB in the class (7.6 snaps/target), he only gave up 0.66 yards/snap in coverage. One area of improvement could be his tackling efficiency, as he missed 1 out of 9 tackles he attempted in his final year at Alabama.